I often bang on about the small publishers I work with but the reason is this they tend to bring us the titles we wouldn’t see otherwise. That said this was a bestseller the second time it came out in Russia Eduard Stepanovich Kochergin was born at the height of Stalinism in 1937 and his parents were considered enemies of the state and he as a young boy was sent away to state orphanage for children of political prisoners. This book follows that time and his six-year journey across the heart of Russia from Siberia to Leningrad his hometown. One his arrival to Pipsqueak ward he talks about the other wards, scarry to say the least !! The book starts with him at home with his family and his christening at a church on Nevsky prospect and also his polish mother and Russian father firstly he was given poles for safekeeping.But was eventually sent to the state house and out to Siberia. We see him on a ward with other young orphans where he meets some other boys with names like the Toad and his deputy screwface. This is a brutal place but seen through a child’s eye Eduard or Stepanych becomes the shadow in these place and disappears. Living only at night when they are alone he grows sadder missing his parents and home, which leads to the young boy setting off on a six-year journey on the trains. He meets thieves. Then stumbles into a village where they still have a tradition of brewing.Gets taught how to make a fire all the time slowly making his way back home but does he? Food was the main topic of our life. The dreams of the orphans mainly revolved around food, especially in winter and spring. During that time, as our hobbling lady said, we were liable to eat everything that wasn’t nailed down. In summer we ate weeds, rising catching a colon infection and falling into the clutches of the Absolute Drip. This short passage reminded me so much of Dickens in particular Oliver when he is at the orpahage as well. I read this last week as my father was actually in Vladivostok a place in the far east of Russia a place he said still had a feel of its Soviet past. This is tale of a boy become a man but also a tale of post-war Soviet times the toughness of when Stalin sent so many to the Gulags, this is the flipside of a writer like Solzhenitsyn as it is about the children of those prisoners those young souls we never heard about the brutal nature of the state orphanage. Seen through his eye but in the same way as books; like the boy in the striped pyjamas or curious incident in the night we see how violence can be seen but not really absorbed till much later. There is also a sense of adventure as we follow his homeward journey a sense of entering a wide world and learning skills and about danger first hand. Also glimpsing a dying rural world of Russia hinterlands with rituals and myths still alive in the 1950’s. A powerful memoir of one man’s journey to adulthood in a Soviet world that could have stepped out of a Dickens novel but 100 years on. Well when this dropped though my door ,it was one I put straight to the top of the pile ,I’ve enjoyed all the recent books from Finland ,That I’ve read have been gems ,plus I’ve always had a fondness for books set on trains so two ticks meant it was a must read .Well Rosa Liksom is a Finnish based writer ,she is also a well-known artist in Finland .She has written 13 other books ,this Compartment No.6 is the latest by her ,it won the Finlandia prize in 2011 . When the station bell rang for the second time she saw a muscular ,cauliflower-eared man in a black working mans quilted jacket and a white ermine hat and with him a beautiful dark-haired woman and her teenage son ,keeping close to his mother . When she first sees Vadim Nikolayevich Ivanov on the station platform at Moscow . 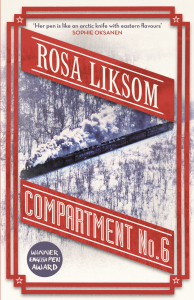 Compartment No.6 Follows a train ride from Moscow on the Trans Siberian ,an unnamed finnish girl boards the train ,she searches and finds an empty compartment and settles down ,then her silence is shattered when a grizzled looking fellow enters the carriage , He then starts talking to the girl and telling her the story of his life at first she is a bit like a rabbit caught in the headlights not quite knowing what to do ,but as the train speeds through the russian hinterlands she warms to this rough diamond and maybe sees part of her own life in his stories ,as the train is stopped they experience the rough conditions of the Soviet era ,this is the late eighties ,initially the girls thoughts are on getting to Mongolia and see some cave paintings as she is an art student and meeting an old friend but as her and Vadium (the man ) ,grow see maybe sees her life in a wider view outside the life she grew up in . The night speeds through the dark into dim morning , a dogged queue at the shrine of the WC , a dry wash among the puddles of pee ,sputum ,shame and sheepish looks ,shadows of steaming tea glasses in the window ,large flat cubes of Cuban sugar ,paper light Aluminium spoons ,black bread ,viola cheese ..
She captures life on the train so well the sights and sounds of Soviet life at that time . Well this is one of those books you can tell came from a love of the writer ,it turns out the writer took a journey on the same train in 1986 ,where she herself shared a compartment with a Russian man .Rosa Liksom has the artist eye for detail so the little things of life in Soviet era Russia are caught so well .For me the story remind me of a very old friend that over the years I lost touch with but Like Vadium was a rough diamond ,yes I remembered my fist meeting Steve and thinking god this bloke is just awful he was a friend of a friend but then over the next few meeting ,I saw through the swearing tales of his very hard upbringing and got to know one of the kindest souls I ever met and regret losing touch with ,That said Vadium isn’t quite such a kind heart soul but he is more than he first appeared to the Girl and he is the person that opens her eyes on her world ,so like me with steve this is someone she will remember for the rest of her life .Rather like the last lines of the film Stand by me ,a writer remember a friend and journey in younger life . Have you a favourite book based on a train ?